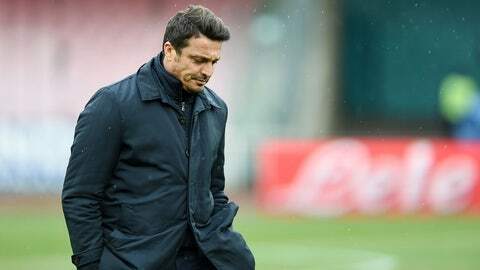 It’s hard not to have some sympathy for Pescara coach Massimo Oddo. The former AC Milan and Italy defender is coaching his hometown team but has endured the worst of seasons. The newly promoted side sits at the bottom of Serie A and has not truly won a game this season despite “boasting” a 1-17-6 record. It's three-point haul came only after Sassuolo fielded an ineligible player, overturning what was a 2-1 defeat into a ceremonial 3-0 win. So the wonder is not so much what Oddo can do to improve things, but that he remains there at all. This week could prove the final straw. Sunday’s game against Torino was the tip of the iceberg: Torino was 3-0 up inside quarter of an hour, 5-0 up on the hour. Pescara rallied to make it 5-3, but that did little to change the final analysis, which reads: 11 goals conceded in its last two games (last week it lost 6-2 to Lazio) and 15 defeats from its last 17 games. In the week building up to the game, the car of president Daniele Sebastiani was set alight outside his house. Some suggested it was fans unhappy with the team; Sebastiani himself claimed it was a potential buyer trying to drive down the purchase price. As it stands, Sebastiani has insisted that Oddo has his support for the whole season. Whether the feeling is mutual remains to be seen: sports director Luca Leone apologized on behalf of the club after the game, and said that both he and Oddo are weighing up their futures. As a Pescara fan, Oddo is particularly distraught by the team’s plight. If Oddo decides to step away, Gigi de Canio is a possible replacement.